In the past decades, the Department of Second Language Studies has experienced considerable growth and renown in its graduate courses and programs. The year 2003 marked the 35th anniversary of the Department of Second Language Studies (then ESL) and the 45th anniversary of the English Language Institute (ELI). The Department held its 40th anniversary celebration at the UHM Campus Center on September 19, 2009. 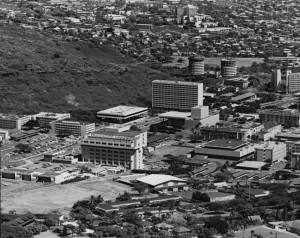 During the 1950s, the English Department had regularly set aside special sections of several courses to meet the needs of nonnative speakers of English at the University of Hawaiʻi at Mānoa, but with the increase of international students at the University, this arrangement became viewed as unsatisfactory. Therefore, in 1958, the English Language Institute was established, with Charles Hockett as its first Director. The ELI had two goals: to provide English language instruction for international students, and to train teachers of ESL/EFL. The ELI has continued to offer courses for the past 45 years for both undergraduate and graduate students at the University, and currently provides a wide range of courses in academic listening, reading, and writing. The ELI is the site of a great deal of development of materials and testing instruments. Teaching in the ELI is carried out primarily by graduate assistants and lecturers. In 1960, the teacher training component of the ELI shifted to an interdepartmental MA program in TESL, which was administered cooperatively by the departments of English, Anthropology (then responsible for offering linguistics courses) and Speech. It is interesting to note some of the major differences between the original MATESL program of 1960 and the current MA program in SLS. The original program was available only to foreign graduate students, and native speakers of English were not eligible for admission. This restriction was dropped in 1962, and both native speakers and nonnative speakers now comprise the student body. The original program was viewed as a teaching degree, whereas the current program emphasizes research and theory in addition to classroom practice (the word “teaching” was dropped from the degree title in 1970). The original program consisted of 36 credits (it went up to 39 at some point, and returned to its current requirement of 36 a few years ago), had only required courses (the current program offers a wide range of electives and specializations), and was a non-thesis program (students now have a Plan A, thesis or a Plan B, non-thesis, “scholarly paper” option). In 1965, Dr. Richard Sittler, Director of the ELI, also became chair of the MATESL program. He thought it unusual that the chair of the graduate field of study was not a member of any of the three contributing departments, namely English, Linguistics (no longer subsumed under Anthropology) or Speech. The ELI at that time was a recognized academic unit, but was neither a department nor a part of any department. Therefore, Dr. Sittler proposed the establishment of a new Department of English as a Second Language. 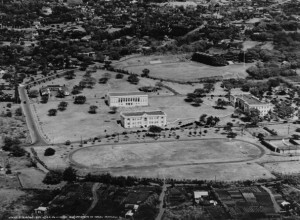 On March 20, 1968, the Council of Deans approved the establishment of the new department, incorporating the ELI and the MATESL program as a single unit within the College (now Colleges) of Arts and Sciences. The Department of English as a Second Language thus became the first such department established in the United States or, as far as we know, anywhere in the world. At the time of its establishment, there were 11 other MA programs in TESL/ESL in the United States, of which four were administered by English departments, three by linguistics departments, three by various other units, and one was interdepartmental. Though there are many more programs of this kind now (in 2005, the TESOL organization listed 232 in the US, though this includes ones with “teaching” as well as “linguistics” among other descriptors in their names), departmental status is still rare. Over the years, the Department of SLS has evolved in many ways. Due to the untimely death of Richard Sittler just before the new department came into being, Theodore H. Plaister became the first Chair of the new department. Since then, the Department has been chaired by Mark Lester (1969-71), Ruth Crymes (1972-75), Robert Krohn (1975-77), Richard Day (1978-1984), Richard Schmidt (1985-1990), Craig Chaudron (1990-1994), Roderick Jacobs (1994-1999), Robert Bley-Vroman (1999–2001; Fall 2002-2003), Michael Long (Spring, 2002), Robert Gibson (2003–2006), Richard Day (2006-2009), James Dean “JD” Brown (2009-Dec. 2011), and Graham Crookes (Jan. 2012-present). While the initial faculty were professors of anthropology, linguistics, English or speech, the current faculty (still representing a variety of disciplinary backgrounds, but with increasing disciplinary preparation in applied linguistics and second language studies) view the field of second language learning and teaching as a field which is independent of any parent discipline. The 1980s and 1990s saw a considerable turnover in the original ELI-based faculty, so that currently, the faculty are predominantly oriented toward graduate studies, professional training, and research. For these recent reasons, in 1999 the department initiated and had approved the changing of its name to “Department of Second Language Studies,” effective July, 2000. 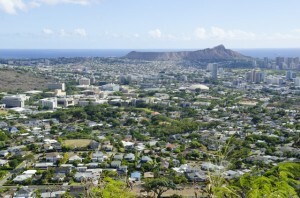 More than a decade of comparisons of the prominence of Hawaiʻi’s faculty with institutions around the world, including a formal survey, demonstrate that the faculty and programs of the department are recognized as among the most outstanding in the world. The MA program in SLS is widely recognized as among the best such programs in the United States and internationally, and the PhD program has rapidly demonstrated its excellence. Its faculty are regularly invited as plenary speakers at major conferences in North America, Asia, and Europe, they serve on the editorial boards of the major research journals, including as main editors, and they have served on the executive boards and as presidents of major professional organizations such as TESOL and AAAL. In addition to the MA program, the Department offers a BA in SLS (and other options through the Interdisciplinary Studies, for example a concentration in ESL and Bilingual Studies through the campus-wide Interdisciplinary Studies Program). Its PhD program in Second Language Studies (formerly Second Language Acquisition until 2009) was initiated in 1989, and it began its Advanced Graduate Certificate in SLS in 2000. The Department also engages in organized research projects, as its faculty and graduate students have been heavily involved in obtaining and maintaining the National Foreign Language Research Center from 1990 to now, and the Department provides support for the Center for Second Language Research, jointly established with the Social Science Research Institute in 1983, which has been the recipient of several large federal and local grants. A new center for research was established in 2002, the Charlene J. Sato Center for Pidgin, Creole, and Dialect Studies.